Will be posting a load of images taken by a friend of one of my USA sources of Discovery at Edwards. Lovely pics...will post on this thread over the next 10 mins. RE: Discovery at Edwards Images. Cool. What the heck are those strange lorrys doing following her? Aren't they ground power and cooling for her? Correct. Can't remember the names of the vehicles off the top of my head, but that is correct. Jesus! I must be learning something! One thing has always made me wonder, how many guide vehicles out the front do they need? Sure, one vehicle to make a last minute check for debris on the road would be fine, but what are the other two or three for? Surely people can see and make way for the slightly overgrown albatros! True. Good point, because so would I! Lol, i have a very weird image in my head now of her in a bubble bath! You mean you've never seen a Shuttle have a bubble bath? Dont speak too soon, Next thing you know, Chris will have an inside report, with pictures on Discovery having a bubble bath! Kids read this you know! Oh dear, what have we started! I nearly choked on my drink when i read that! (EDIT). 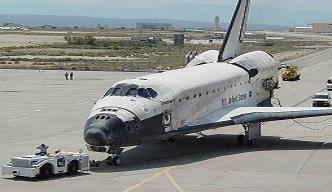 I found this picture of Discovery on NASA's website. It's one of the neatest ones I've seen for awhile. Could it be the "universal coolant trailer"? New gear? Do see correctly that the left wingtip TPS is missing? Did it break off on landing? Damn, good spot. I'm sure one of the USA guys will say if that's right or not on here. FlightStar....any help on this - I don't see it. I don't see it..can anyone be more specific? I take it you don't mean the TPS tiles where there is a darker color on the tip leading to avions than the RCC leading edge - as that's how she's meant to be. That may answer a question why Dryden didn't allow their site to have any images of Discovery during this section of post-landing. Allow me to go back, take the large file picture from what was sent to me, and blow up the area in question for a better look if possible. I'm not a TPS guy. I don't see anything obvious, but as I said, I'm not a TPS guy. Yes, Chris, that was the area. Your cropping shows it better than I remember it when i jumped to my conclusion. I reread my reply that said I was mistaken and realized it might be misinterpreted that I still found some fault on the tip. So, to be clear, I goofed. I should never have brought it up without first researching the photos. I was thrown by the lack of greying along the mosaic of tip tiles and airleron tiles. This tells me these tiles did not see as high temperatures as they used to OR they are made from the newer, higher temperature and harder FRCI tile formulation. Gradual replacement of all HRSI tiles was planned, but I lost track of the timetable. I don't remember the wing tips being squared-off as much as these pictures show and I wonder if the tip contour was slightly changed. As I said before, the wingtip is not an area I know very well. Well that's better than there actually been an issue. I'll settle for that everytime.